Tonight I will be sending out the new issue of the Growing Bookworms weekly email newsletter. (If you would like to subscribe, you can find a sign-up form here.) The Growing Bookworms newsletter contains content from my blog focused on children's books and raising readers. There are currently more than 380 subscribers. This week I have four book reviews (one early reader, two for upper elementary and middle schoolers, and one for young adults). I also have an announcement about a book previously reviewed that is now available (Inkdeath by Cornelia Funke) and an announcement about the nominations for the 2008 Cybils. That is all that I have this week for the newsletter. My blogging time has been completely taken up by first traveling to Portland, OR this weekend for the KidLit Blogger Conference, and then by my efforts to spread the word about the Cybils (I am the official Literacy Evangelist for these children's and young adult literary bloggers' book awards). I do urge you, my faithful newsletter subscribers, to read the Cybils announcement, and to participate by passing the word along to people you think might be interested and/or by nominating books for this year's Cybils. Nominations open first thing tomorrow (Wednesday). Reviews coming out over the next week (only because I wrote them before the conference) include Piper Reed: The Great Gypsy by Kimberly Willis Holt, Dodger and Me by Jordan Sonnenblick, and Violet Raines Almost Got Struck by Lightning by Danette Haworth. Thanks for reading, and for growing bookworms! And please don't forget to participate in the 2008 Cybils. Thanks! 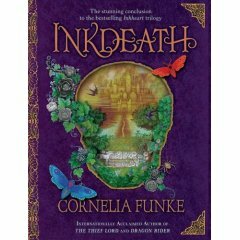 In the Inkworld series, Cornelia Funke has create a unique premise (people being read in and out of books), a fascinating setting (the Inkworld), and three-dimensional characters that the reader will care about. And so, I recommend that fans of the series definitely read the third book. Inkdeath is now available for purchase. Don't miss it! I loved the first two books in Tim Egan's Dodsworth series: The Pink Refrigerator and Dodsworth in New York, and I was eager to get my hands on this third one. 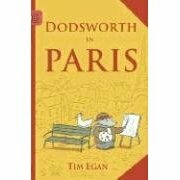 Dodsworth in Paris is a very early reader (four chapters, with color illustrations taking up more than half of each page) in which Dodsworth, a humanized and human-sized mouse, and his friend the duck continue their travels. Dodsworth is the practical one, while the duck is constantly trying new things and getting into scrapes. For example, the duck decides to fly paper airplanes off of the observation deck of the Eiffel Tower. This might have been ok, except that he made the planes from the money that Dodsworth was carrying in his backpack. But the duck keeps Dodsworth on his toes, and open to new adventures. And Dodsworth's appreciation for his feathered friend comes across on every page. There are lots of funny bits in Dodsworth in Paris. I think the funniest is when the duck goes to investigate the bells ringing in Norte Dame. Up in the belltower, he finds "a bent-over fellow ringing the bells." There's a nice visual of this hunchbacked bellringer. The Tour de France, Impressionist art, and berets also make their way into the book (Duck makes a beret out out of an acorn cap). Kids will take the story at face value, but there is plenty of humor for adults, too. I also like the resilience of Dodsworth and the duck. When they lose their money, they find a job. When they lose that, Dodsworth finds another way to earn money, with the duck's help. They don't sit around moping, or expect other people to solve their problems for them. Egan's ink and watercolor illustrations add tremendously to the humor of the book, while also lending emotional depth. There's a lovely scene in which Duck gets out of a scrape, and Dodsworth hugs him. Dodsworth looks tender, but the duck is looking at him sideways out of narrowed eyes. The text notes, "The duck didn't really like to be hugged." There's another scene in which a tear drops from the duck's eye, but "He wasn't really crying. He just had something in his eye for a second." The detailed illustrations perfectly complement the understated text, just as the adventurous duck complements the more staid Dodsworth. Dodsworth in New York and Dodsworth in Paris are perfect "step-up" books for picture book fans who are are just learning to read. The sentences are short, the vocabulary is mostly simple, and there is plenty of dialog. And yet, there is much more going on here than in a typical early chapter book. There are distinct personalities, humorous moments, gorgeous illustrations, and life lessons all wrapped up in a deceptively simple package. Tim Egan is brilliant, that's all I have to say. And I look forward to Dodsworth and the duck's next adventure (perhaps in London...?). 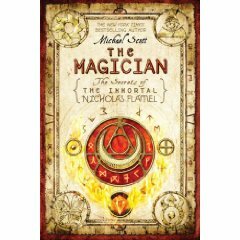 The Magician is the sequel to Michael Scott's The Alchemyst, in the Secrets of the Immortal Nicholas Flamel series. The story picks up immediately following that of the first book, with the arrival of Nicholas Flamel, twins Sophie and Josh Newman, and warrior Scathach in Paris. Their rival, John Dee, is joined by the somewhat reluctant ally Niccolo Machiavelli. Both men were made immortal by Elders, and owe those Elders service, at whatever the cost. Machiavelli has a high position in the French secret service, and is in a position to use legal means to stop Flamel and his charges. Fortunately, Josh and Sophie's team uncovers new allies, too. I kind of like Machiavelli, too, even though he is on the wrong side of the conflict. He stores his spells on a computer, because he "had always used the latest technology". And despite many skills, he can't drive. Like the first book, the Magician is action-packed and suspenseful, with various battles, grotesque monsters, rampant destruction, and a creepy scene set in the catacombs below Paris. Scott alternates between multiple narratives (including the thread of Flamel's wife, Perenelle, who is being held prisoner by Dee on Alcatraz). He uses the transitions to build suspense for each part of the story. I found this second book to be a bit faster-paced than the first, with more humor. And yet... I still found that I couldn't identify sufficiently with the main characters, Josh and Sophie. Sophie demonstrates considerable magical skill in this book, and even uses her clever human mind to save the day from time to time. Josh spends a bit more time than the reader might prefer being jealous of the fact that Sophie was awakened before him. He does show bravery, and concern for his sister, but also reveals an ugly streak of bare ambition. I think that the reader is meant to identify with his human flaws, but I find him annoying. I think the real problem is that Josh and Sophie both feel like pawns, in a book where the adult and immortal characters are the ones who understand what's going on. I'll still pick up the third book in the series, The Sorceress, when it's available next spring. I'm interested to see which historical characters in London have become immortal, and what side they're on. And I'm intrigued by the hint of the title that Perenelle may play a more major role. I'm curious about the story. But I won't be waiting for this book with the same degree of anticipation that I have for, say, the fifth Percy Jackson book, because I don't care about the young protagonists in the same way. 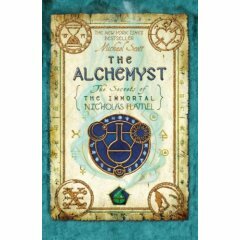 The Alchemyst is the first book in Michael Scott's middle grade fantasy series: The Secrets of the Immortal Nicholas Flamel. The publisher sent me a copy of the second book in the series (The Magician). Shortly thereafter, a review by Tricia from the Miss Rumphius Effect made me want to read both books, and so I had to pick up a copy of this one. The story begins one sunny afternoon in San Francisco, when teenage twins Sophie and Josh Newman witness the kidnapping of local bookseller Perry Fleming. A valuable book is also stolen from Perry's husband, Nick, although Josh (who works in the bookstore) manages to hang on to a few precious pages. Nick sweeps Sophie and Josh away before the kidnappers can return for the lost pages. He tells Josh and Sophie many incredible things, not least of which is that he is actually Nicholas Flamel, the famous alchemist, born in France in 1330. Nicholas has been keeping himself and Perenelle alive and youthful by following an ever-changing formula in the magical book (The Book of Abraham the Mage). Without the formula, Nicholas and Perenelle will age at a rate of about one year per day. Nicholas must race against time to recover the book, and rescue Perenelle, before he dies of old age. The Alchemyst is action-packed, with the characters racing from one dangerous situation to the next. Plot, setting, and premise are all intriguing. It's a fun read, one that I think kids will enjoy. I was keen to move on to read the second book. My only complaint is that I found the characterization to be a bit flat. It's not that Scott doesn't try to make the characters interesting. Sophie is quite clever, thinking of practical solutions that the magicians around her would have missed. Sophie and Josh are close, but Josh isn't above jealousy when Sophie gains something that he doesn't have. One can see that theme continuing through the other books. But somehow, I didn't connect with either of the twins, or with any of the other adult/immortal characters (Flamel is basically a cipher - you aren't meant to connect with him). And this hindered my appreciation of the book. Which is too bad, because I really loved the historical tidbits. I would still recommend the book to fantasy fans, especially those who like their fantasy set atop the real world, and to people who are intrigued by ancient legends. Adults who enjoyed Katherine Neville's The Eight might also find The Alchemyst diverting (both books feature historical figures as characters). But I wish I identified with the characters more. Cecilia Galante's debut novel, The Patron Saint of Butterflies, has been on my radar (and on my bookshelf) for several months now. I finally sat down to read it yesterday, and found that I was unable to stop reading until the book was finished. The end is particularly compelling. The Patron Saint of Butterflies is the story, told in alternating, first-person chapters, of two fourteen-year-old girls who live in a religious commune called Mount Blessing. Agnes, like her parents, is completely under the spell of the commune's charismatic leader, Emmanuel. She strives to meet Emmanuel's requirement of perfection, and punishes herself when she, being a human teenager, fails. Agnes' best friend, Honey, by contrast, is a bit of a rebel. Left behind as a baby by her mother, her father unknown, Honey holds an ostracized position at Mount Blessing. Her very separation from the mainstream community gives her the perspective to question Emmanuel's restrictive teachings (privately - open questioning would be dangerous). Agnes wants to be a saint, while Honey just wants to escape. As the story begins, Agnes and Honey are both recovering from a visit to the compound's "Regulation Room", where Emmanuel metes out vicious and humiliating corporal punishment to anyone (including young children) who violates Mount Blessing's strict rules. Agnes' grandmother, Nana Pete, makes an unexpected visit to Mount Blessing, and learns for the first time of the brutal punishments (these punishments never take place during her customary, scheduled visits). Nana Pete immediately decides to rescue both girls, along with Agnes' younger brother, Benny. But rescuing Agnes, fully indoctrinated into the ways of Mount Blessing, proves not to be so simple. 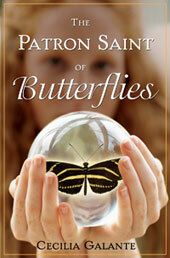 The Patron Saint of Butterflies is the story of Agnes, Honey, Benny, and Nana Pete's journey. The genius of this book is Galante's telling of the story from both Agnes and Honey's perspectives. Each girl's personality comes through clearly, and together they give the reader a full perspective on life in this repressive religious commune. Through Agnes the reader gets a glimpse of why people might choose to live in such an environment, while Honey's doubting perspective highlights Mount Blessing's problems (for instance, she wonders why Emmanuel and his partner, Veronica, are able to watch television and drink expensive wine, while these things are forbidden to everyone else). Galante allows the reader to see and sympathize with each girl's perspective, even when the two friends disagree. Cecilia Galante's bio states that she lived in a religious commune in upstate New York until she was fifteen. Her background, I think, lends tremendous authenticity to this book, without ever getting heavy-handed. But I agree with something that Galante said on her website: "The most important thing was getting the characters, who, while figments of my imagination, are still very much their own persons, to matter to the reader." While the facts about Mount Blessing are interesting, the characters of Agnes and Honey are what make the book compelling. I ached for both Agnes and Honey (and, to a lesser extent, for Benny and Nana Pete) when I was reading the book, and by the end, I felt like they were real people. "The sky is a brilliant bowl of blue. I hate that. On days like this, when everything hurts the way it does, I wish the sky would turn black and that it would rain and rain until I felt better again. I move as quickly as possible, bent over at the waist, clutching the hem of my robe in one hand, pausing briefly to stuff my pockets full of small stones. The welts on my rear end and the backs of my legs make the awkward movements painful. I grit my teeth and offer up the pain for the lie I have just told. One final point. I appreciated the way the publisher put Agnes and Honey's chapters in different fonts, to make it easier for the reader to see when the first-person viewpoint changed. This wasn't strictly necessary - the characters are quite distinct - but it was a helpful detail, showing the care put into the book. Highly recommended for high school students and adults, especially for those looking to better understand people who choose to live in religious communes. This book would make an excellent springboard for discussions about faith, family, friendship, and the power that is sometimes given to religious leaders. But really, this book can be enjoyed by anyone looking for a compelling story about strong and unique characters. An announcement from Random House about the release of Christopher Paolini's Brisinger. An announcement that I tied with The Well-Read Child as winner of the Best KidLit Blog, in last week's Book Blogger Appreciation week. Many thanks to those of you who took the trouble to vote for me! 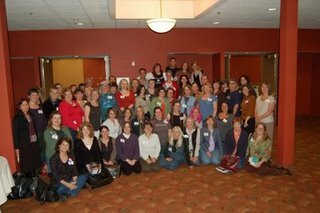 A thank you post to Amy, the organizer of Book Blogger Appreciation Week. Reviews coming out over the next week include Dodsworth in Paris by Tim Egan, The Alchemyst and The Magician by Michael Scott, and The Patron Saint of Butterflies by Cecilia Galante. My blog will be relatively quiet this weekend, because I'll be attending the Kidlitosphere Conference in Portland. I hope to see some of you there. Thanks for reading the newsletter, and for growing bookworms! I just did a Kidlitosphere round-up post on Sunday. But since then, a bunch of things have come up that I'd like to share with you. First up, in Cybils news, the middle grade/YA nonfiction committee has been announced. Also, my official new title within the Cybils organization was announced: Literacy Evangelist. I'm not sure who thought of it, but I do love it. I might get business cards made up. But seriously, I'll be working to get the word out about the Cybils, so that more people can participate in nominating titles, and more people will learn about our fabulous winners and short lists. Evangelizing, if you will, for the Cybils and for literacy. And finally, do check out Liz B's reasons for liking the Cybils, and seeing them as important, at Tea Cozy. At Grow Wings, Laini Taylor shares some reasons for authors to blog. Laini and I will be discussing the bridge between authors and reviewers at the Kidlitosphere Conference in Portland this weekend, and I'm sure that we'll be talking about author blogs as part of that discussion. Some additional logistical details about the conference from Jone MacCulloch can be found here. Franki shares the first of what promises to be a series of "Books I Could Read A Million Times" at A Year of Reading. She's learning about these books because she's working as a librarian, and reading the same book to several different classes. She explains "I got this idea from Bill at Literate Lives. My hope is that by reading the same book to all of the kids in the school, we have anchors to talk about--books that can be talked about at dinner tables at home, books that can be talked about with friends in other classes, etc." I almost forgot! Tomorrow is National Punctuation Day. I was reminded by a post at the International Reading Association blog. Here's the first part of the press release on the topic: "Why is punctuation important Jeff Rubin the Punctuation Man and founder of National Punctuation Day explains that without punctuation you would not be able to express your feelings in writing not to mention know when to pause or stop or ask a question or yell at someone" ... and so on. Also via the IRA blog, applicants are being sought for the Teachers in Space program. "The nonprofit Teachers in Space program is seeking two Pathfinder Astronauts who will become the first astronaut teachers to fly in space and return to the classroom." I don't like to write about politics on this blog. But I did want to mention a post by TadMack at Finding Wonderland that expresses some concerns about the recent launch of the YA for Obama site. TadMack's issue (and there is a great discussion going in the comments) is not about the candidates themselves, but about whether or not a group of popular YA authors talking with teens in this way about a particular candidate constitutes "undue influence". Colleen Mondor summarized the part of this that bothers me: "This is a bunch of YA authors who have joined together to do two things: get under-18s interested in democracy and help Barack Obama get elected. TadMack wonders if you accomplish both those goals while not allowing any room for positive discussion of John McCain (and the folks who support him)." The sad news came out this week that L. M. Montgomery, author of the Anne of Green Gables series (and other beloved books) committed suicide. I first heard about this at Sarah Weinman's blog, and I've also seen reactions at Charlotte's Library and Bookshelves of Doom. You can find the full story in the Globe and Mail, in which "Kate Macdonald Butler reveals a long-held secret about her grandmother, one of Canada's most beloved authors." Butler says "I have come to feel very strongly that the stigma surrounding mental illness will be forever upon us as a society until we sweep away the misconception that depression happens to other people, not us – and most certainly not to our heroes and icons." I completely respect her decision to share the news, but it is sad to think that someone who brought so much joy to the world was that depressed. On a brighter note, I know that I mentioned it before, but the Just One More Book! interview of Jon Scieszka, our National Ambassador for Young People's Literature, is simply fabulous. Do give it a listen, if you can spare a few minutes. And that's all for today. Hope you find some food for thought! Jennifer Fosberry's My Name Is Not Isabella is not a nonfiction title, but it does convey a number of facts about famous women from history. Thus, although it's a bit of a stretch, I've chosen to feature it for nonfiction Monday. My Name Is Not Isabella takes the reader through a day in the life of a little girl who imagines herself as Sally Ride, Annie Oakley, Rosa Parks, Marie Curie, Elizabeth Blackwell, and Isabella's own mother (an endnote explains that "A mother is a person who uses love and wisdom to raise children to be caring, accomplished adults"). At the start of the book, Isabella announces: "I am Sally, the greatest, toughest astronaut who ever was." A paragraph at the end of the book gives readers more background about Sally Ride (and similarly for the other women). Isabella's mother, shown primarily in the background, often truncated or in shadow, humors Isabella each time, calling her by her most recently declared name (while simultaneously, with gentle firmness, walking Isabella through catching her bus, doing her homework, and setting the table, etc.). The mother is always too late in what name she uses, however, as Isabella rapidly moves along to another hero. The end of the story leaves Isabella dreaming of who she'll be tomorrow. The last page of the book includes a list of works consulted, both books and websites, for more information about "these and other exciting women". Mike Litwin's illustrations, apparently a combination of colored pencil and digital collage, keep this history-based book fun. Isabella is a spunky and engaging figure, with a huge head, yarn-like purple hair, and mis-matched clothing. Her constant companion is a beat-up stuffed mouse with purple button eyes that pop out from the page. As Annie Oakley, she holds a bottle of syrup like a gun, with the syrup's label a picture of a maple leaf. The implements that Dr. Elizabeth Blackwell uses are photographs of ornate silver utensils. On each page where Isabella declares herself to be a different woman, the woman's name, and one of her major attributes, are shown in a large font, one specific to that woman (kind of an old west font for Annie Oakley, etc.). But really, I think that the key to the success of this book is that Isabella looks, on every page, like she's having fun. She's not "learning history". She's excited to pretend to be each of these historical figures because they are exciting. I especially liked her pretending to be Rosa Parks while on her bus to school. This felt real and appropriate. And so, based on Isabella's genuine appreciation of these important women, I recommend My Name is Not Isabella. I think it would be a good choice for parents wanting to introduce, in a relatively gentle, non-didactic manner, some strong female role models. Plus, the illustrations are fun. Recommended for preschoolers, especially girls. The First Book Blog has a lovely post about a new literacy program started by Justin Tuck of the New York Giants. "The Mayor’s Office selected four, Title I schools to participate in this exciting new program to get sixth and seventh grade students from across New York City, interested in reading. Justin created a Book Club, in which each child is responsible for reading one book per month, four books total, during the football season and writing a brief book report. These reports will be judged by a panel including Justin’s wife, Lauran Tuck." I really think it's wonderful when sports figures get out there and tell kids about the importance of reading. Missouri Passages, a publication of the Missouri Humanities Council, has an article by July Douglas about boys and reading. The article includes suggestions for the general types of books likely to please boys (with reference to Jon Scieszka), and also has some suggested titles. Douglas concludes "if you find that a boy in your life is not as enamored with reading as you had hoped, maybe he just hasn’t discovered the kinds of reading materials that really speak to him!" Speaking of Jon Scieszka, Mark from Just One More Book! interviewed Scieszka last week about the National Book Festival. I even contributed a question or two to the interview. It's just up now at JOMB. I haven't even had a chance to listen yet, but I'm adding it in to the roundup before I go to sleep, and will listen first thing tomorrow. But I know that the combination of Andrea's research, Mark's interview skills, and Scieszka's humor will make this interview not to be missed. Corinne writes at PaperTigers about the 9th Annual “HOG WILD” About Reading Motorcycle Ride for Literacy. "On Sep 21, over 100 riders are expected to ride from Port Moody, BC, Canada to Harrison Hot Springs in an effort to promote literacy and raise money to buy new books for school libraries. Since the event started, in 2000, the fundraiser has brought in $87,000 to benefit the cause, and this year organizers hope to push the running tally over the $100,000 mark." Whatever works, I say. The Brightspirit Relief Fund Auction launched this week. I mentioned this auction once before -- my friend and co-Cybils team member Sheila Ruth from Wands and Worlds has been organizing it. According to the press release: "An online auction is being launched nationwide on September 20, with the goal of raising funds and awareness for Literacy in Arkansas. The drive will feature autographed and personal items donated by popular authors Erin Hunter, Rick Riordan, Brandon Mull, and many other talented authors and artists.... The auction will be held in memory of a ten-year-old girl, Emmy Cherry, who was killed earlier this year in tornados that swept through central Arkansas." Hmmm... any guesses on which items I'm most likely to bid on? An article by Kate V. Pedroso and Lawrence de Guzman in the Philippine Daily Inquirer describes a local program "aimed at encouraging mothers to read to their children... “This project will involve mothers who will read aloud to their children … not only to impart valuable lessons to their kids, but more importantly, to inculcate among the children the joys and pleasures of reading,” said Aurora Lim, Zonta’s president." The Williams Lake Tribune (Canada) offers back-to-school tips to improve literacy, starting with "Let your children see you read, and set aside time each day for family reading". One nice thing about the article is that it's not limited to elementary school kids, but also offers tips for parents of secondary school kids, like "Encourage your teenagers to explore magazines or appropriate websites on subjects that interest them to keep them interested in reading". Last week was a bit hectic, between Book Blogger Appreciation Week (the complete list of winners is here) and the announcement of the first Cybils panels (Poetry, Middle Grade Fiction, Fiction Picture Books, and Easy Readers, so far). But I did save up a few other links. I'm honored to have received this beautiful "I (heart) your blog" award from both Becky of Becky's Book Reviews and Andrea from Just One More Book!. I'm touched, Andrea and Becky! I love your blogs, too. I'm supposed to nominate seven other blogs, and pass along the award, and tell them each that they've been nominated. You all know my position on that -- I feel that I show my appreciation for the blogs that I love by linking to them in my visits posts. And yet... this week I feel like I should do more. So, I'd like to go a bit further, and offer this award to the dozen blogs that I added when I first created my blog roll, almost three years ago, and that remain among my favorite sites: Finding Wonderland, Bartography, Read Roger, Read Alert, Kids Lit, Chicken Spaghetti, Tea Cozy, Big A little a, Wands and Worlds, Book Moot, Book Buds, and What Adrienne Thinks About That. I had pretty good judgment back then, didn't I? You guys all rock, and I do love your blogs. If you feel so inclined, please do pass along the award to others. This just in, the September Carnival of Children's Literature is now available at Jenny's Wonderland of Books. Jenny includes quite a few links to reviews of classic children's books, as well as more modern fare. Jenny and I share a fondness for Alexander Key's The Forgotten Door, which makes me happy. You can also "Submit your blog article to the next edition of Carnival of Children's Literature which will be held October 26, 2008 at The Well-Read Child using our carnival submission form." Speaking of Just One More Book!, Andrea and Mark have started an e-newsletter. The first edition contained: "announcements about (their) upcoming: * Picture Book Pilgrimage, * children’s book and literacy related conference activities, and * exciting autumn guests." You can sign up here. Two fun posts from Emily at BookKids (the BookPeople Children's Book blog): Kids Books are for Grown-Ups, Too! and Grown-Up Books to Share with Kids & Teens. Of course I favor the former over the latter - Emily picked some great titles. Congratulations to Susan Beth Pfeffer, whose Life As We Knew It made the NY Times Bestseller List for paperback children's books for the first time this week. She is very happy. I'm happy, too, because it's one of my favorite books. Shrinking Violet Promotions has a reissue of a great post about self-care for introverts. If you missed this one last year, and you think you might be an introvert, you should definitely click through to check this one out. I missed Talk Like a Pirate Day on Friday. But Sherry from Semicolon and Elizabeth O. Dulemba did not, and they have the scoop. Elaine Magliaro shares poetry resources about fall at Wild Rose Reader. I especially like how she uses fall colors for highlighting throughout the post. Jenny from Read. Imagine. Talk has a guest post at 5 Minutes for Books this week. She writes about children's books based on television shows, and has some surprisingly positive things to say. Also at 5 Minutes for Books, Lauren from Baseball and Bows shares a delightful story about her young son's degree of bookworm-ness. Shannon Hale has a lovely new post in her "how to be a reader" series. This one is about "reviewing the review", and who, and what, a review is really for. My favorite sentence is "A review can turn the intimate experience of reading into a conversation that enlightens both sides." I like that idea a lot. Reading is such a solitary experience, usually, but in reviewing a book, we open up avenues for discussion. I like that!